Both Kevin Plaxco and Michael Gross have set a precedent with this book. In deliberate and well thought out steps, the reader gets a very firm grasp of not only the diversity and abundance of life on this planet but the well timed evolutionary steps needed for organisms to develop into intelligent species, such as ourselves. The authors demonstrate good rationale with their objectivity, especially when it comes to connecting the Big Bang with the formation and spread of those elements essential to life. Indeed, much of the logic involves an acceptance of chance and incidental good timing, with just a hint of scepticism for some of the previously cherished tenets of mainstream science. This is the method of science and simply adds to the enjoyment of the book. There are no orchestrated attempts to realign your thinking to theirs. Plaxco and Gross discuss in sequence the formation of the first galaxies and stars, the development of basic forms of life into more complex organisms and end up looking seriously for the extraterrestrial constructs that may signal E.T. and his variants. The argument is simple; did life develop elsewhere in the Universe as it did here and what is the biochemical diversity or chemical makeup of that life? Are there Bio-markers out there yet to be found to answer that question in the affirmative? Get your science news straight from the scientists themselves. No hype, no spin, no bull: just the facts.Australia’s most inspiring scientists choose to write about their world-class discoveries in Australasian Science, Australia’s only monthly science magazine. Australasian Science is dedicated to Australian and New Zealand science, providing a unique local perspective on scientific developments and issues that other science magazines can’t match. Australasian Science boasts Australia’s most experienced team of science journalists, including Australia’s only two international Science Journalism Laureates. Its Patrons are Nobel Laureate Prof Peter Doherty and renowned science broadcaster Robyn Williams, representing excellence in science and its communication. Written in simple language, Australasian Science is a unique and independent source of news and commentary on local scientific developments. ‘Astro-Space News’ editor David Reneke is now representing Australasian Science. ORDER ONLINE: You can order your Australasian Science subscription with our secure online order forms. Telephone: To place your order by telephone with a credit card call (03) 9500 0015. PRICES : Back issues are $10 each including GST. This price includes delivery within Australia. This yearbook has been published since 1991 and is written by Australians for Australians. By using this book and a good planisphere, you’ll be armed with powerful tools for those first learning their way around the sky. The Astronomy 2012 book is a guide to the Southern Hemisphere with a month by month chart of the stars, moon and planet positions. The Ufologist Magazine explores fringe subjects such as UFOs, Unexplained Phenomena, the Paranormal, Crop Circles and New Sciences from Australia, New Zealand and overseas. This is achieved by contributions from some of the most informed and highly experienced researchers and scientists in Australia and abroad. Scientists include: Dr. Bruce Maccabee: He carries a Ph.D in Physics from the American University in Washington DC and has carried out physics research for the navy since 1972. Bill Chalker: Author of the ‘Oz Files’, is an industrial chemist with an honours science degree. He is one of Australia’s foremost UFO researcher. Rex Gilroy: A field naturalist and historical researcher, whose’ work encompasses subjects such as the Yowie, is one of the most controversial and thought provoking contributor of the Australasian Ufologist Magazine. The UFOlogist magazine is staffed by enthusiasts who want to ascertain the reality of UFO & Paranormal enigma, and we welcome all information in an attempt to promote a greater understanding of this phenomena. This is achieved with an open mind and developed, logical, unbiased and structured approach. Dave Reneke is a regular contributor to UFOLOGIST with articles on astronomy and space science appearing in every issue. What is Amateur Astronomy Magazine About? On July 20, 1969, a quiet, determined man from Wapakoneta, Ohio, stepped out of his fragile spacecraft and into history. Neil Armstrong–engineer, naval aviator, test pilot, astronaut and devoted family man–became the first man to walk on the Moon. In this powerful, unrelenting biography of a man of no particularly spectacular talent yet who stands as a living testimony to everyday grit and determination, former NASA historian Hansen has achieved something quite remarkable. Like a rich pointillist painting, he has created a magnificent panorama of the second half of the American 20th century by assembling a multitude of luminescent moments in one man’s life. From Armstrong’s birth to a middle-class family in Ohio to the mind-boggling fame of the Apollo 11 triumph, and later his service on the commission investigating the 1986 Challenger space shuttle disaster, Hansen details it all. He writes of the number of rounds of 20-millimeter ammunition loosed by Armstrong’s fighter squadron in Korea in October 1951 (49,299), his heart rate on liftoff in Gemini VIII (146 beats per minute) and the price of a signed Armstrong letter at auction ($2,500). Rather than overwhelming, this accumulation of details gives flesh-and-blood reality to a man who is more icon than human. With the recent renewal of interest in manned space travel, this book is a must for astronaut buffs and history readers alike. Readers cannot expect any more access to his emotional interior than the first man to walk on the Moon has ever allowed, but they will learn about everything he achieved in aerospace engineering. “Apollo: Through the Eyes of the Astronauts”: July 20, 2009 is the 40th anniversary of the Apollo 11’s landing on the Moon. In celebration of that historic event that represented ‘one small step for a man, one giant leap for mankind’, the NASA team of Robert Jacobs (Deputy Assistant Administrator for Public Affairs), Michael Cabbage (Director of the News Services Division), Constance Moore (Head Photo Researcher), and Bertram Ulrich (Curator and Multimedia Manager) have collaborated to produce “Apollo: Through The Eyes Of The Astronauts”. Each of the twenty-one astronauts from the Apollo program have selected a favorite photograph from his space flight to be included in this memorial book. Enhanced with an informative foreword by Stephen and Lucy Hawking, “Apollo: Through The Eyes Of The Astronauts” tells the individual stories of the astronauts on the Apollo missions. 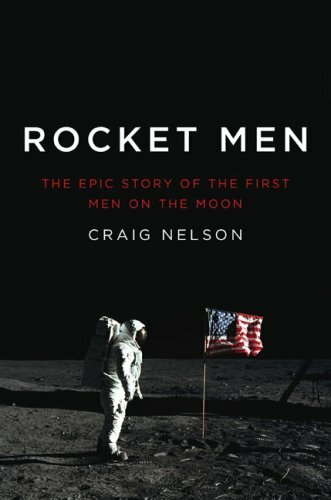 Craig Nelson gives Apollo and the space effort the full nonfiction treatment in this 416-page history. He draws upon interviews, NASA oral histories, declassified CIA documents and detail-rich reminiscences about the social milieu surrounding the Moonshots. This single sentence describing what it was like around Cape Canaveral just before Apollo 11 was launched. It was the middle of summer in the middle of Florida, meaning a heat that melted asphalt onto the soles of barefoot children and a humidity that made women sweat like Teamsters, especially that remarkable gaggle of lithe and adventurous females that made their way to Cocoa for every shot. This is, without a doubt, one of the most fascinating books you’ll ever read on the lead up to the Moon landing, and the space race in general. It reaches into the personal lives of all the major players and delivers information on the human aspect that most other chroniclers miss. Of course, Craig covers the technical areas as well and does it in a way that even the most complex of issues are rendered easy to understand. In fact even seasoned space buffs and those who are widely read on the subject, will learn so much from this book. It has history, purpose, and a point to be made … that this era of human endeavour should never be forgotten. Chaikin teams up with Apollo 12 astronaut Alan Bean to produce a book written for the 9- to 12-year-old set – or for older readers seeking a simple, straightforward account of the Apollo era. As we move away from the twentieth century, the shining moment of the first Moon landing seems to grow brighter. Placing that event within the context of the whole Apollo program, this handsome, large-format book spotlights 12 significant missions, from Apollo 1, with its fatal cockpit fire, to Apollo 17, with its sweet success and bittersweet awareness that the program was ending. Chaikin, author of A Man on the Moon (1994), has extensively researched the Apollo program and conducted hundreds of related interviews, including 28 with former Apollo astronauts. Beyond a wealth of pertinent anecdotes, this background knowledge brings a subtle understanding of complex decisions and human emotions at pivotal moments as well as a broad perspective as the Apollo missions moved gradually toward their goals. Informative, full-page sidebars focus on topics such as the work of the Mission Control teams and the early fear of “Moon germs.” NASA photos provide excellent color illustrations of the Apollo missions. More unexpected and personal are the many stunning paintings and insightful captions by Alan Bean, who walked on the Moon during the Apollo 12 mission. Alan Bean’s paintings take centre stage in this coffee-table compilation of his artwork, accompanied by inspirational quotes.Essays from art experts and reminiscences from Apollo flight director Gene Kranz shed light on both sides of Bean’s career – as a left-brain astronaut and a right-brain artist. The book is unique in that, as many of you know, Alan Bean was an astronaut. He is famous for piloting the lunar module on Apollo 12 and is the fourth man to have set foot on the Moon. At the age of 49, during the time he was training for a space shuttle mission, Bean decided to leave the space program. Why? Because he wanted to pursue his artistic talents full time. Twenty-eight years later, a body of glorious paintings fills the pages of this book.Here is a person who went to space, walked on the Moon and has the ability to paint about the experience. The book is divided in sections. Essays on Bean’s art from art critics appear at the beginning. 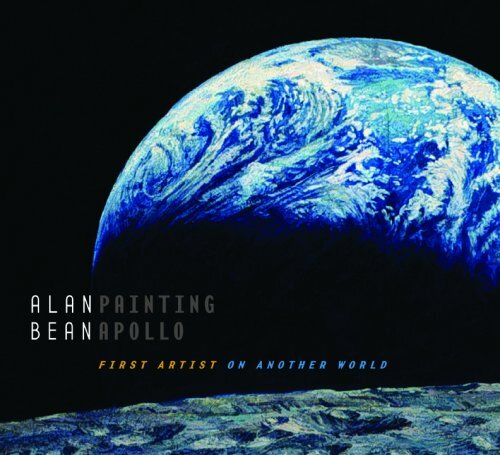 The book chronologically depicts Bean’s paintings from the Apollo missions from the time they were painted, 1982 to 2008. Quotes by famous writers, scientists, and visionaries appear in juxtaposition to Bean’s paintings. Afterward, Gene Kranz, Apollo flight director, describes what it was like to be a part of the space program during the time of the Apollo missions. In the book’s non-3-D section, Bell explains what the Moon missions did for humanity and why we should push on with space exploration. Astronomer Jim Bell flies readers to the Moon, just in time to celebrate the 40th anniversary of Neil Armstrong and Buzz Aldrin’s famous first steps on the lunar surface. 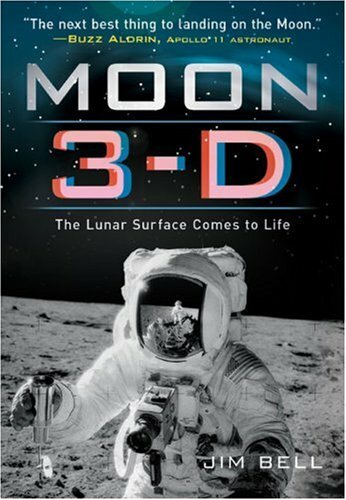 After a series of brief essays explaining the history and future of lunar exploration, the volume launches into a spectacular showcase of the best 3-D images available, taken by both robotic and human exploration missions; the pictures shot by the Apollo astronauts on their Moon walk receive special attention, and are accompanied by an artistic selection of non-3D images. In 1969, Buzz Aldrin became the second human, minutes after Neil Armstrong, to set foot on a celestial body other than the Earth. The event remains one of mankind’s greatest achievements and was witnessed by the largest worldwide television audience in history. In the years since, millions more have had their Earth-centric perspective unalterably changed by the iconic photograph of Aldrin standing on the surface of the Moon, the blackness of space behind him and his fellow explorer and the Eagle reflected in his visor. Describing the alien world he was walking upon, he uttered the words “magnificent desolation.” The flight of Apollo 11 made Aldrin one of the most famous persons on our planet, yet few people know the rest of this true American hero’s story. 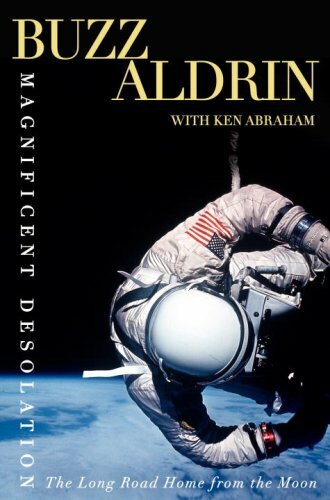 In Magnificent Desolation, Aldrin not only gives us a harrowing first-person account of the lunar landing that came within seconds of failure and the ultimate insider’s view of life as one of the superstars of America’s space program, he also opens up with remarkable candor about his more personal trials–and eventual triumphs–back on Earth. From the glory of being part of the mission that fulfilled President Kennedy’s challenge to reach the Moon before the decade was out, Aldrin returned home to an Air Force career stripped of purpose or direction, other than as a public relations tool that NASA put to relentless use in a seemingly nonstop world tour. The twin demons of depression and alcoholism emerged–the first of which Aldrin confronted early and publicly, and the second of which he met with denial until it nearly killed him. He burned through two marriages and his Air Force career came to an inglorious end. Redemption came when he finally embraced sobriety, gained the love of a woman, Lois, who would become the great joy of his life, and dedicated himself to being a tireless advocate for the future of space exploration–not only as a scientific endeavor but also as a thriving commercial enterprise. For those of us who lived through it, the Space Race, as it came to be known, was a time that galvanized the entire world. You just knew you were experiencing something raw that would never happen again. Space dominated the print media and the 5 o’clock news bulletins. Everywhere you turned it was there. 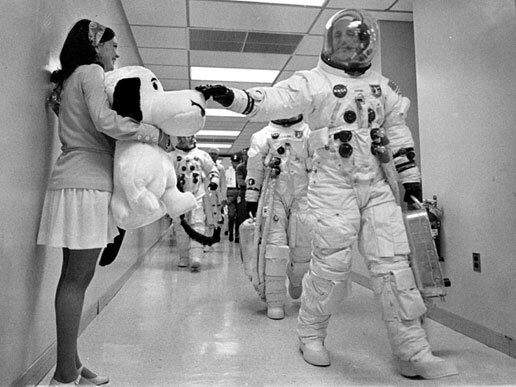 Every kid wanted to be an astronaut. We watched huge rockets launching men with the ‘Right Stuff’ and knew that President Kennedy’s dream would soon become a reality. Men would be walking on the Moon before the end of the decade – and we couldn’t get enough of it! America Vs the Soviet Union – us against them. It was a race into space. It’s history now. America won the moon race, but who says there can’t be a rematch? 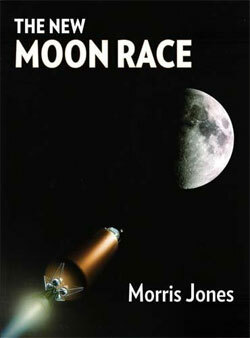 Morris Jones believes there can and gives his reasons why in his new book, ‘The New Moon Race’ from Rosenberg Publishing. In a well researched, well written hardback he reviews the first fledgling steps of a developing space program, detailing its hopes, dreams, failures and repercussions. Jones then introduces us to the latest players in a new reach for space. Russia, China, India and Japan all have their eyes set on fresh goals in space exploration, and it could see the United States take a backseat if their Shuttle replacement falters. Space advocates have warned that China could send humans to the Moon before the end of the next decade, even before NASA returns under current exploration plans. Former NASA administrators have said that and most of the space community see it happening as well. A red flag on the Red Planet is becoming a distinct possibility, probably within 10-15 years. Others, though, have expressed skepticism and Jones acknowledges this in his book as he traces a future timeline that seems not only realistic, but sensible as well. Determining what China, and other nations, are really planning to do in terms of future solar system exploration lies at the heart of The New Moon Race. Private missions to the Moon, including Space Adventures’ proposal for a Soyuz circumlunar flight and the Google Lunar X PRIZE, are also discussed. Jones hedges his bets and falls just short of predicting the certainty of a second ‘space race’. Shrewdly, he leaves the reader to form his or her own opinion. I found myself wrestling with this question throughout the entire 180 pages of the book. The author is an Australian spaceflight analyst. He writes with enthusiasm and authority. I found the larger print easier on the older eyes and the illustrations and photographs were possibly some of the best I’ve ever seen in a book of this nature. As for the title of the book, it’s up to you. If there is another race to anywhere let’s hope it is to the Moon and eventually Mars. I was promised that as a kid and I want my legacy. Reading ‘The New Moon Race’ gave me hope it will happen. History shows us that the dream of flying is as old as human imagination. The notion of actually rocketing into space may have originated with Chinese experiments with gunpowder in the Middle Ages. This of, course, is how human beings eventually gained the ability to catapult themselves into space. 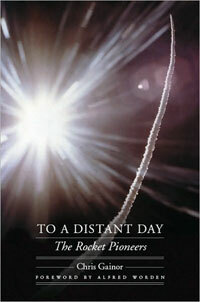 Chris Gainor’s new book, To a Distant Day, recreates the colorful history of how rocketry came to be. It offers an irresistible narrative introducing us to pioneers such as Konstantin Tsiolkovsky, Robert Goddard, and Hermann Oberth, who pointed the way to the cosmos and created the earliest wave of international enthusiasm for space exploration. Gainor gives us a look into the life of German engineer Wernher von Braun who created the V-2 – arguably the first large fully functioning rocket. It opened the door to space, eventually leading to the development what historian’s now call ‘Von Braun’s legacy – the mighty Saturn Moon rocket. From there Gainor skillfully follows the space race to the Soviet Union and the United States and gives us a close look at the competitive hysteria that led to Sputnik, satellites, space probes, and finally human spaceflight in 1961. It’s a story of cultural ambition and personal destiny, interspersed with detailed accounts of our collective scientific progress. For the purist, To a Distant Day offers a complete and thoroughly compelling account of humanity’s poignant and simply amazing attempts to leave this planet. All the players in this unfolding drama of space travel receive respectful treatment for their individual successes without leaving out their disasters and human failings. It knits well and follows in logical chorological order. You aren’t moved constantly back and forth along the timeline as irritatingly evident in other books of a similar nature. This book is very well written and just as difficult to put down. It fully deserves to stand alongside most of the more well known books of the genre with equal respect. If this book has any drawbacks, I’d say it’s a little short. However it does provide an excellent bibliography in its “sources” section for those interested in further reading. In the new documentary, “Live from the Moon: The Story of Apollo Television”, director Mark Gray sets out to tell in exquisite detail the side of the story we never hear about, the race to the moon as sent through the television lens. Before viewing the documentary I must admit, I never gave it much thought either. You just sort of took it all for granted. Until now, no one has really told the story of the television transmissions we saw that heralded in this new age of space, culminating in man’s first footsteps on another world. Gray, through his company Spacecraft Films, has put together a complete record of the Apollo television transmissions .This is, in my opinion, the definitive work on this subject. Gray’s DVD represents seven years locating, remastering and restoring NASA footage from both the agency’s vaults and the National Archives from a time when live television from space was in its infancy. For a story of this magnitude the raw materials are in abundance. The painful part for a producer I guess would be making the cuts. There are some really good aspects of the story that just needed to be included and Gray, mindful of continuity, has skillfully threaded these into a compelling and entertaining film. I loved it, and didn’t want it to finish! ‘Live from the Moon’ tells the story of live television from the Moon through an extensive series of interviews with astronauts and the technicians who developed the cameras that recorded their momentous steps. Included in the documentary are real the stories and personal feelings from those who manned the ground stations in California and Australia and the obstacles they had to overcome. One was the obvious difficulties in developing black-and white and, later, color television cameras that could be flown on the missions and transmit images back to earth with the limited bandwidth available. As the Apollo missions progressed, advancements in both camera hardware and processing technology back on Earth resulted in greatly improved video quality. Gray interviewed astronauts, flight directors, mission controllers, tracking station operators, historians and those who built the television cameras for the space program. ‘Live from the Moon’ is told with the insight of moonwalker Alan Bean; Apollo 10 commander Tom Stafford; and flight director Chris Kraft, among others. This DVD is compelling watching. Make no mistake about it, it will keep you riveted throughout its entire length. I personally rate it as one of the top three documentaries on genre I’ve ever seen! The last word must come from Gray himself. “Of all the times to be alive, I think of witnessing the Apollo television transmissions live as quite an honour. It was a magic time, and the story of how it was accomplished is worthy of being told,” I heartily agree!